This great Three Stooges vintage daybill movie poster is rare for two reasons. 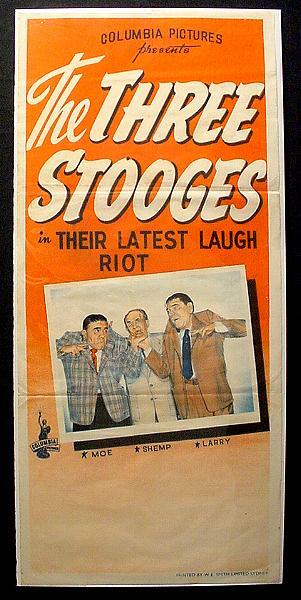 First, it is an Australian version of The Stooges in "Their Latest Laugh Riot," printed by W.E. Smith Limited Sydney. It was put out to promote Shemp episodes soon after he replaced Curly in the late 40's/early 50's. Second, it features a mistake: it pictures Shemp and Larry with the names listed under the wrong Stooge! We're not sure what knuckleheads were responsible for that, but it makes this poster all the more valuable today. It has nice color graphics, with the Columbia Pictures logo. There is some edge crease wear, pin holes, yellowing from age, and normal folds you see in theatre posters. Overall it is in very good condition. It is displayed on acid free backing with acid free sleeve. It is 13 1/4" x 30". This will be a great poster for the true Stooge collector and VERY RARE! !